The proposed changes, which Alberta Transportation Minister Brian Mason acknowledged were spurred by the deadly crash involving the Humboldt Broncos hockey team, should fix some of the shortcomings they see that, if left unaddressed, hold the potential to lead to future mishaps. The province had actually been pondering changes to the commercial trucking industry long before April’s crash involving the Humboldt team bus and a semi-truck operated by a Calgary based company, but the crash prompted the province to expedite the timeline. The changes Alberta is eyeing for driver training would include a mandatory entry-level training course for drivers applying for Class 1 (tractor trailer), Class 2 (bus) and S endorsement (school bus drivers) licences. Improved driver training would certainly be a good thing for everyone who is on the roads on a daily basis. Today’s roadways are well populated with commercial vehicles and it only makes sense that larger vehicles in particular be handled by drivers who are well trained and well skilled, as most of them are. In fact, truckers are among the best drivers on the roads. But, it’s the inexperienced or improperly trained drivers who are likely to cause problems, and it’s those that the province’s changes will address. The province is also making moves to deal with problems with Alberta’s driver testing and licensing system that were highlighted in a 2016 consultant’s report. The currently available 60-day temporary safety licence allows companies to operate while they await a federal safety fitness certificate, and if a certificate application is refused, the company can just re-open under a different name. Mason said the trend is “a particular problem” in Alberta and he believes eliminating the 60-day temporary certificate will effectively halt that practice. “We have complaints every week and there is a complete lack of oversight,” Mason said earlier this week. 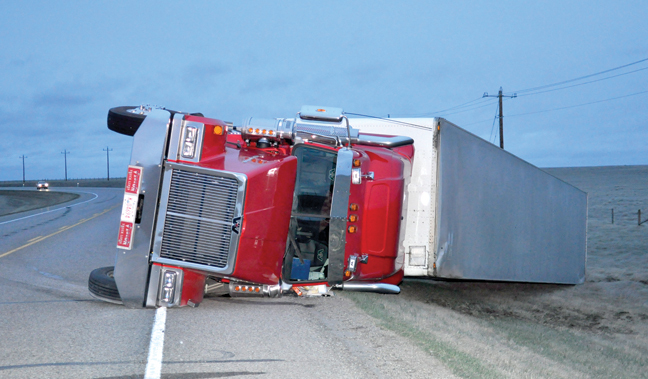 The province’s efforts to improve trucking safety were applauded by organizations like the Alberta Motor Transport Association, the Association of Alberta Registry Agents and the Canadian Trucking Association. We applaud the moves, too. If they help make our roads safer, they’ll be well worth it. Training of Professional Drivers has been inadequate for 40 years even in jurisdictions such as Saskatchewan where government employees through SGI have been involved! As a truck driver/trainer for years now I can tell you that a system that simply teaches people how to drive does not a Professional make! If I were to train you to be a Professional you must first understand what that means! I am aware that you can operate a vehicle and obey traffic laws! What I look for in a student is impatience! Impatience kills thousands of people a year and causes 100’s of 1,000’s of accidents! Impatience is why people race amber lights, don’t stop at stop signs or pass when unsafe! People do not like their travel interrupted or slowed! A Professional can not be an impatient driver! The other characteristic I look for in a student is Professionalism! Most do not even understand what that means! In our drive you will witness many who are impatient and un-professional and only now when you truly understand what it means to be professional and what is demanded of you can we get in a truck and learn to drive Professionally!